Pick-up begins at 8:15am with a short 30 minute ride to Destrehan Plantation. Transportation is provided by our sister company “Alert Transportation.” The driver goes hotel to hotel for the pick-up service. We ask that you allow us up to 30 minutes for the pick-up which will be curbside of your hotel. While taking the Destrehan Plantation tour, you will be viewing the oldest standing Plantation in the Mississippi Valley that is surrounded by majestic, 300 year old Oak Trees. The house has been beautifully restored to its original glory. The Destrehan Plantation house tour is approximately 1 hour and is given by professional tour guides that will enlighten and entertain you on this trip through history. A Slave Quarter museum is a part of your tour of the plantation grounds. That will give you 20 minutes after the tour to walk around the grounds and take some pictures. Then its off for a Cajun Blast!!! On this tour, you will experience the best of both: a swamp tour and an airboat ride. You will travel at high speeds on the airboat then slow down and stop for pictures. Your Captain will give you a tour of a life time explaining the culture, animals, and the swamps. You may even experience a close encounter with some of the local swamp life. Gators will get close……. real close!!! So close that you will be able to look into those reptilian eyes. You will return to your hotel around 2:45pm depending on traffic. 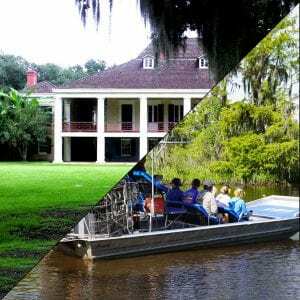 Destrehan Plantation Tour – House tour about 1 Hour, Hotel pick-up and Transportation included. The History begins with a muddy river called the Mississippi River and dense swamp lands. Rene-Robert Cavelier Sieur de Salle traveled the beginning of the river to its end. He claimed the territory for France anticipating it to be a source of great wealth for the country. A young son of a Paris financial family, which was part of the court of Louis XV, packed his trunks and sailed to the new world. Destined to find a family that would have a profound impact on Louisiana and the entire United States, he helped set standards by which new territories would be included into the union and shaped the laws of the State of Louisiana. Little did this young man suspect that his son’s family home would still be standing in the 21st century. We now refer to this home as Destrehan Plantation.